Horizon Complete offers the very best value for quality combination available anywhere. 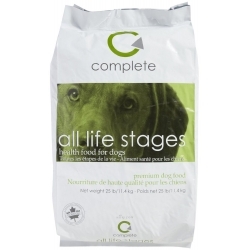 Our only grain-based formula, Complete has an animal inclusion rate of 71%, is GMO, chemical preservative and growth hormone free, and has an extremely low GI which helps to regulate blood sugar, aids in disease prevention and assists in weight reduction. They use pure, real, whole grains to give pets optimal nutrition from their food. They choose quality, whole grains such as barley, rye and oats - no corn, potatoes or tapioca. Each ingredient they use is chosen with care and purpose, is sourced locally, and quality is controlled from the farms they partner with straight to your family.